In the tenth edition of Dysgeusia, Getintothis’ Laura Coppin returns to muse on her absence, Russkaja’s inimitable howling, old favourites Year of the Goat and the ambitiously enigmatic Native Construct. It appears that my unplanned, self-imposed exile (I could say hiatus, but what is life without a generous pinch of melodrama) has come to a close, as once again I find myself presenting my fevered scribblings to you all. I would ask if you’ve missed me, but I think we both know the answer to that and it’s never nice to attempt a grand return only to discover nobody noticed you were gone in the first place. Amidst my alarming bursts of both glowing and ill health I’ve dragged my stunted frame for miles across the mountainous terrain of South Korea, slept illicitly on the highest peak of a remote island while the sea became the sky, and stuffed my greedy little face at Alain Ducasse’s Eiffel Tower restaurant Le Jules Verne during the most arse-achingly romantic trip of my young life (I imagine that as the organiser I shouldn’t really describe it as such, but it’s my column and I’ll do what I want). There have of course been moments of unequivocal, abject horror, but in the interest of making my life seem as exciting as possible they’ve been swept and firmly pinned under the metaphorical Rug of Nope beneath which I conceal all I find distasteful. Soon to explode into being is this year’s Boomtown Fair, an event which stands absolutely no chance of spending an eternity weighed down by the conveniently heavy Table Leg of Denial. Last year’s Chapter was a riot of sound, sights, and savage kicks to the chest; crowned by the mighty Polska noisemongers Russkaja chasing the crowd with an imaginary Soviet tractor. Though sadly not taking to the stage this year, the rambunctious Austrians will at least be unleashing their new album Peace, Love and Russian Roll on the 24th July. 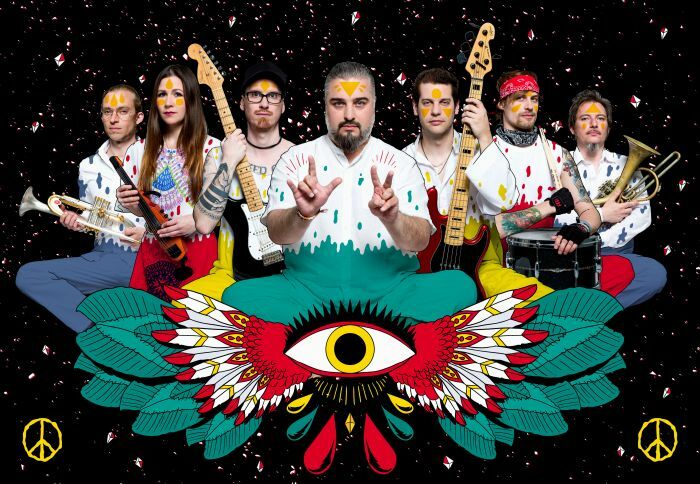 As is to be expected, Peace, Love and Russian Roll is a delightfully silly romp of a record; overflowing with Georgij Makazaria’s inimitable bellows and brilliantly catchy rhythms which interweave everything from punk and ska to country. Russkaja have always approached the human condition in an endearingly tongue-in-cheek manner, with this record being no exception – with Let’s Die Together (Mon Amour) and Radio Song both beautifully encapsulating the clichéd emotions that come with extremes of romantic love. The former (with its sentiment abundantly clear in the title) mixes soaring violins and over-the-top semi-operatic vocals with gruff howls and squealing trumpets, while the latter has some of the most brilliantly silly lyrics I’ve heard in as long as I can remember: “I clean my teeth… I use a brush… only for yoo-hoo”. There Was a Time and Salty Rain instead tackle the lows of loss and heartbreak, with There Was a Time centring itself around a wonderful oomph-ing trombone and the magnificently titled Salty Rain opening with an absolutely filthy saxophone note that drags itself belly-first along a grimy alleyway before coming for your ears. There’s no denying the fact that it’s as fun and light-hearted as music gets, so those with more sombre tastes may want to steer clear, but that’s the secret to Russkaja’s insidiously silly charm – it’s impossible not to listen to them without getting swept up by their child-like enthusiasm. Anyone who follows this column with any degree of regularity will no doubt already be well aware of Year of the Goat, a formidably talented band of Swedes who won my heart with their mixture of wonderfully theatrical, soaring vocals and haunting, atmospheric melodies. Their latest offering (due for release on July 31) is their second full length album, and one which delivers on all of the tantalising promises they made on their sinfully short last release The Key and The Gate. The Unspeakable opens with the mammoth All He has Read, which from its whispered beginnings to its triumphant end manages to last for a remarkable 12.44 minutes without feeling overly repetitious or dull. The almost arrogantly languorous finisher Riders of Vultures is the only other track that comes close in length – one which builds in intensity as it weaves a mystical aural tapestry of dreamlike vocals and pounding drums, tantalisingly hinting at a crescendo-like climax before fading away just as the record began: no more than a whisper. Year of the Goat manage to maintain a remarkable, epic depth of atmosphere throughout, particularly with The Emma – a track which feels as though it’s fluttering inside your chest as Thomas Sabbathi’s vocals soar. There’s an emotive sincerity to their music, without which their melodies could perhaps be seen as a little cheesy. As it is, listening to the album is a truly refreshing experience, and one which I cannot recommend enough. Never one to shy away from the more unusual end of the spectrum, this month’s Dysgeusia finishes with one of the most ambitious records I’ve encountered in recent memory: Native Construct’s Quiet World. Released in April, the premise alone makes it worth a mention, as it tells the story of an unstable, reclusive mute, who, torn apart by the pain of unrequited love, creates a fantasy world in which every denizen is as silent as he. This world doesn’t turn out to be the sanctuary he so desperately sought, however – bestowing him with the moniker Sinister Silence, his people rally behind the enigmatic Archon as he reunites the fractured realms of cloud and sea in a bid to free them all from the mute’s soundless tyranny. Half of a gnat would read this and know immediately just how much it appeals to me, so it’s with an inordinate level of delight that I can say that Quiet World is a genuinely brilliant piece of work, wildly melding genres in a manner that would seem completely incomprehensible if it didn’t work so well. Classical, jazz, prog – you name it, it’s here, all bound together in a maelstrom of boundlessly melodramatic theatricality. Such is the sheer diversity of sounds within each track that it’s incredibly difficult to describe the album with any degree of accuracy, but if you were to imagine that Devin Townsend’s glorious rock opera Ziltoid the Omniscient had instead been released by Mr. Bungle then you may well claw together a reasonable approximation. It must be noted that Quiet World is not without its flaws: mostly self-produced alongside their studies by a group of students at Berklee College of Music, its limited budget and programmed drums are at times all too apparent. Don’t let that dissuade you however as it’s nonetheless a remarkable piece of work, and one which (for me anyway) improves dramatically with a repeat airing. Opening track Mute gives a brilliant taste of what the rest of the album holds, while Come Hell or High Water manages to snake its way into the lead as the stand-out track.